Elbert Gong appeared on Show 274, recorded in August 2013, at age 16. 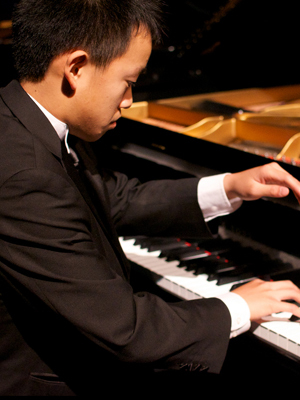 Elbert Gong (piano), 16, is from Belle Meade, New Jersey and attends The Lawrenceville School. He studies music at the Juilliard Pre-College Division with Julian Martin. He is the 2013 first place winner of the American Fine Arts Festival International Concerto Competition and received an honorable mention at the 2013 Juilliard Pre-College Mozart Concerto Competition. Outside of music, Elbert plays on his schoolÕs tennis team and has participated in many school plays.